From top left going clockwise - Nitrate-free sausage, roasted purple cabbage and salad, scrambled eggs and nitrate-free turkey, strawberries and banana's with a melted dark chocolate/nut butter dip for the kids, black bean cakes with an egg, repeat for lunch, amazingly delicious shrimp Kabobs with garlic butter. 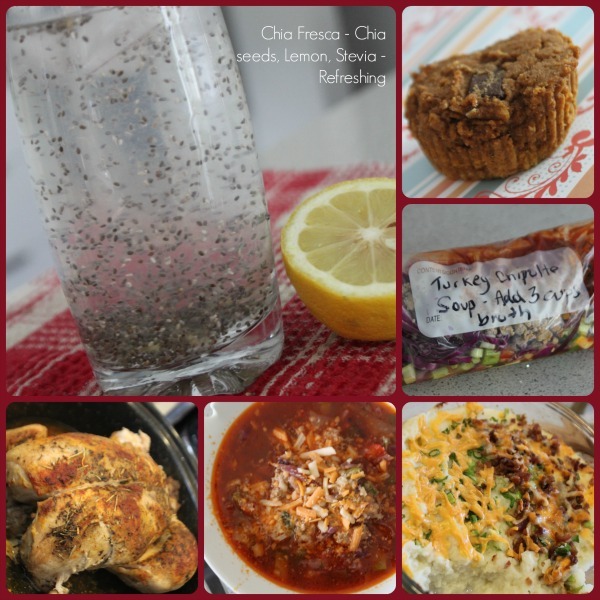 Why such a small snapshot of the food we ate this week? See below. We have been on holidays. Visiting family. Enjoying the summer. 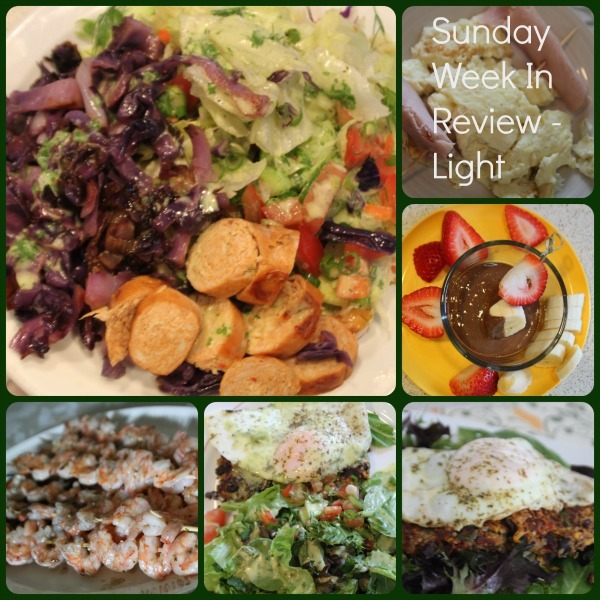 We actually ate lots of clean and delicious food this week. I just didn't have the energy or time to take as many pictures as I usually do. I was actually busy taking pictures of humans for once. My hubby was on holidays this week. It is so nice to have two parents around all day. We spent some time with his family in Brandon. It was really awesome. The kids had a blast. 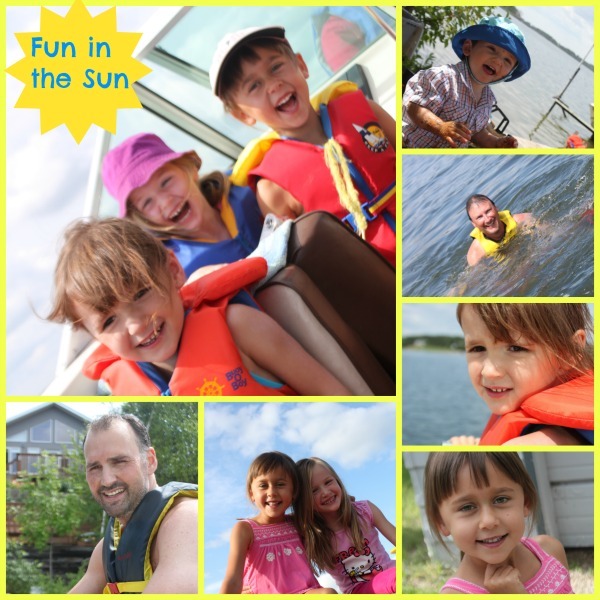 We took them swimming at the Y, swimming and boating at the lake and to an indoor play center. The girls got to connect with their cousin. I love that they connected with all of their cousins in July - just wish they lived closer so it wasn't so sporadic. I did a lot of cooking when we were away. Its really hard for family and friends to know what we can and can't eat so I travel with a big cooler (okay - two), head to the grocery store as soon as we arrive at our destination and basically take over their kitchen. Most people don't seem to mind. Luckily, I'm obsessed with cooking so I don't mind either. And it is a chance for me to show others that clean eating doesn't have to be deprivation. I actually found this trip to be the easiest since I went on the Candida diet. I've learned a few things about what to take with me and that its okay to rely on protein shakes if you have to. We are STILL in the bloody process of looking for a nanny/home day care for our two youngest kids when I go back to work in September. It has been a brutal process that has been very stressful. A huge investment of time (which I would rather actually be spending with my kids since the summer is fleeting) and lots of dead ends. Wish me luck that we finalize something soon so we can put the search behind us and start focusing on the transition. And enjoying the rest of summer. And unfortunately, I got hit really hard by a nasty flu at the end of the week. Really nasty. I haven't been this sick in a very long time. Stomach, head, fever, aches, chills. You name it - I got it. Not a fun way to spend a lovely summer day(s) that should have been spent with the kiddies. But they had Daddy and each-other and didn't really seem to notice I was missing. So I guess that's good. So this is a shorter recap (in pictures anyway) than usual. But life is all about balance and healing your adrenals is about slowing down when you need to. So I'm slowing down on my blogging to enjoy my kids, find a daycare and nurse my flu. But I did decided to share a few more pictures.........because even when I am sick we still eat pretty good. And hubby pitched in by making a delicious anti-biotic free chicken we got from Super Store - he nailed it. Yum! Chia fresca - a friend recommended this to me and I'll tell you its refreshing when you are too sick to eat but want SOMETHING to drink. A new gluten, egg and dairy free pumpkin muffin I whipped up for my kids. Holy Dinnah they loved it. Recipe coming soon. I'm starting to make double batches of things and putting them in freezer bags so we can have a quick slow cooker meal when life picks up the pace in September. Twice baked mashed cauliflower - half with bacon and "real" cheese and half with my daughter's "fake" rice cheese. Turkey chipolte soup. A fresh roaster chicken from Super-Store. Anti-biotic free. It was quite delicious. A little more expensive than a rotisserie chicken but worth it once in a while. Hubby did an amazing job cooking it. He's a keeper. So hope you have a great week. Some great recipes will be coming. And I just wanted to mention that I finally cut the grains back down to NONE. I had been cheating by snacking here and there on my kids cereal, granola, etc. The result - my stomach is SOOOO happy. I don't look 4 months pregnant anymore. Maybe just two. Grains do not agree with me. I know that. And I give you permission to slap me if you ever see me putting them in my mouth. Because they are tempting but not worth the bloat.